A little weekend silliness. Some of us can remember when a visit to the movie theater began with a newsreel and an animated cartoon, along with previews of coming attractions, before the feature film. The cartoons I remember were mostly from Walt Disney (e.g. Donald Duck and Mickey Mouse) or Warner Brothers (e.g. Bugs Bunny and Porky Pig), but there was another studio, Terrytoons, that gave us some lesser known but interesting characters like Heckle and Jeckle, and a few that became TV staples like Mighty Mouse and Deputy Dawg. I don't know the name (if he had one) of the cat in the toon shown above. He bears some resemblance to Warner's Sylvester, and he has as much trouble with the mice as Sylvester does with Tweety. His adventures in this episode can only be described (despite its 1940 date) as psychedelic. "C'mon Everybody/Somethin' Else": Led Zeppelin covers Eddie Cochran. Led Zep does tribute to one of my favorite early rock artists, Eddie Cochran, at the Royal Albert Hall ("Now they know how many holes..."), London, on January 9, 1970. In Jimmy Page's initial guitar attack I hear adumbration of the Ramones. Eddie Cochran died in a car crash during a tour of England in 1960. He was 21 years old. Okay, so I have this thing about dolphins. I've had a soft spot for dolphins since I was seven years old and saw them sporting around the French liner Liberté as my mother and I crossed from England, where my father was then stationed, to visit my grandmother in Pennsylvania. My affection was solidified two years later when, back stateside and in the fourth grade, I read Children of the Sea, by Wilfrid S. Bronson, which told the story of a bottlenose dolphin to whom Bronson gave the generic name Tursiops (the species name is T. truncatus) from his birth in the shallow waters off Florida's Ten Thousand Islands, along the Gulf coast below Naples, through his travels with his mother and the rest of the pod around the Straits of Florida and northward into the Atlantic, with lots of accounts of his encounters with various and sometimes bizarre sea creatures. One of these encounters, with sharks, leaves him injured, and he finds refuge in Nassau harbor, the Bahamas. There he befriends a poor boy named (as I recall) Sam*, who dives for coins tossed into the water by passengers on cruise ships. As I grew I learned more about dolphins: about Pelorus Jack, who guided boats through tricky waters in New Zealand; of their being said to have saved drowning humans; of the size and complexity of their brains; and of their having what seemed to be a language made of whistles and clicks. Recent research even indicates that they know each other by name. From Bronson's book I learned that people in the Bahamas called bottlenose dolphins "herring hogs" because of their appetite for fish. As a child, I was horrified when I read an account by Dr. John Oliver La Gorce, then President of the National Geographic Society, of a fishing trip from Nassau in which he and his companions spotted "a kind of large porpoise[**] called a 'herring hog'" which, "because this species destroys many food fish," they harpooned him, hauled him to the boat and "dispatched him." I was later to learn, through an old issue of National Geographic, that there had been a fishery for bottlenose dolphins on Hatteras Island, North Carolina, in which they were entangled in nets, hauled ashore, and butchered for sacs of oil in their foreheads; the oil was considered ideal for lubricating fine timepieces. (These sacs, I later learned, were essential to the dolphins' ability to echolocate, i.e. to use "sonar," as a means of spotting prey and underwater obstacles.) I was relieved to read that this fishery ended in 1929. As the video reports, the scale of the killings has been declining in recent years. While this is heartening, a Scottish woman, Shona Lewendon, is leading a campaign to have it brought to a definitive close. Her leverage is Japan's bid for Tokyo as venue for the 2009 summer Olympics. and the International Olympic Committee's requirement that host nations adhere to environmental standards. *My memory may be playing tricks with me here. Bronson was a prolific author and illustrator of children's books. Along with Children of the Sea, my elementary school library had three other of his: The Earth for Sam (geology and paleontology); The Sea for Sam (marine biology and oceanography); and The Stars for Sam (astronomy), all of which I checked out frequently. I seem to recall in the forewords to these books that Bronson identified Sam as a nephew. I still recall that he also called the boy in Children of the Sea Sam. 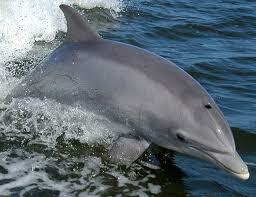 **The words "dolphin" and "porpoise" are sometimes used interchangeably. Strictly speaking, they are two different types of small cetaceans, the class of strictly aquatic mammals that also includes whales.